..So What's in There Anyway? 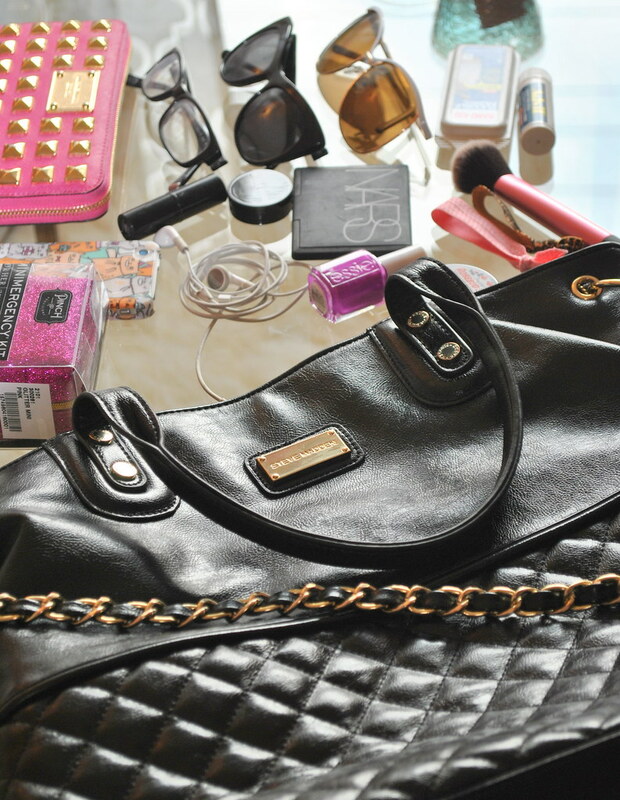 So you all have seen this trusty bag on this blog oh I don't know...six million times. Ever wonder what the heck is inside? Well here you have it. I don't really like to carry a whole lot around with me but definitely like to be prepared. Aside from what you see here (also detailed below) the only other things usually inside are my heels to change into at work, my keys, and maybe my camera (which is why I LERVE this bag, it fits everything!). What do you guys have hanging out in yours? 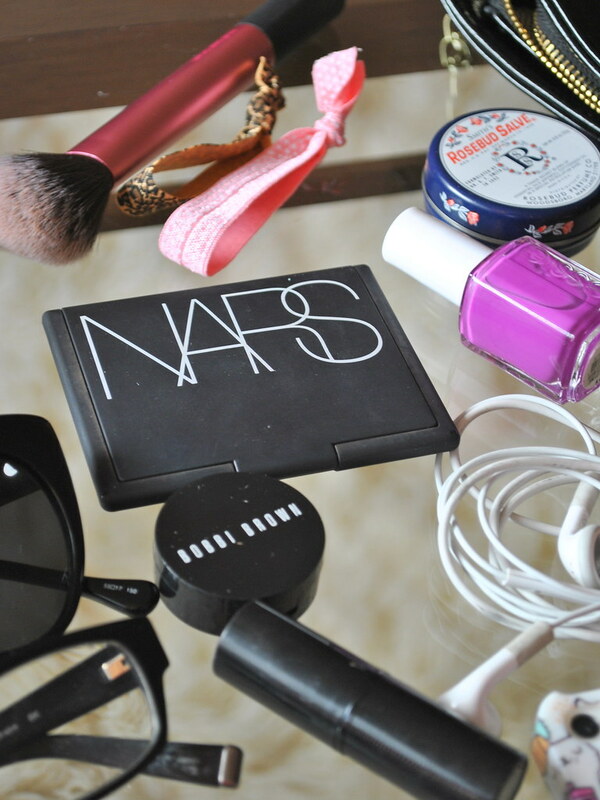 Make Up: I only take the real touch up necessities which are my brozer (and brush), concealer, lip balm, and lipstick. I also usually have whatever my current favorite polish color is in there and some hair ties. 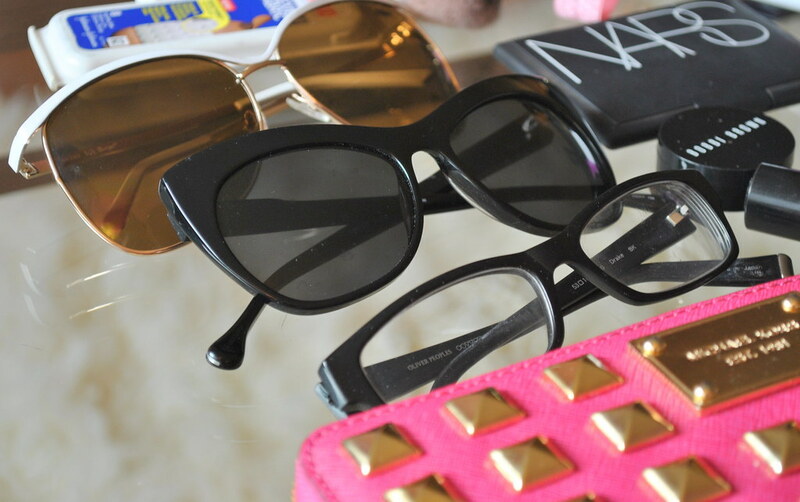 Sunnies: I always have two pairs on me, don't know why. Usually my black ones and some kind of aviator. Spectacles: Yup. I need glasses. Nerd alert. Wallet: Le duh. Mine is this fabulous MK one. Just in case: My AH-MAZING "minimergency kit" (a.k.a. best gift ever. 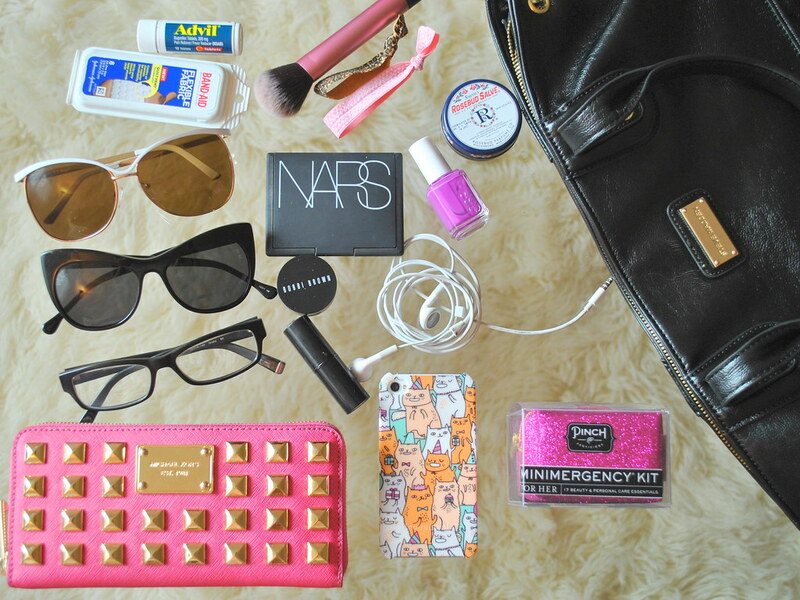 It has 17 little essentials like a sewing kit, tampon, topcoat, etc. would make a perfect bachelorette goody bag stuffer), band-aids for my painful shoe addiction, and advil. iPhone: This guy basically runs my life and feeds my social media addiction. 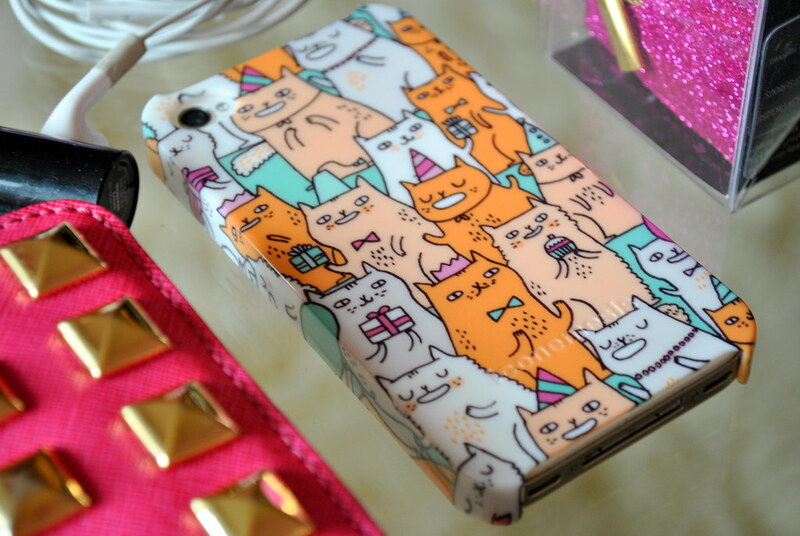 I'm obsessed with my little party-cats case too! Aren't they the cutest? My favorite is the little guy holding a cupcake. Adorbs. Iconemesis makes the best cases, you can see another one I have from my Fairmont Tea experience here (c/o). Ohh, the cat case is just the best. Now I must buy a mini-mergency kit! Thanks for the peek! Is it weird that I like seeing what everyone else carries around with them all day? I like these posts a lot :) In fact, I JUST did my own on my blog today. You should check it out! I really am thinking about buying a ton of minimergency kits! Ooooh...what color is that essie polish?! I think I'm in LOVE! !